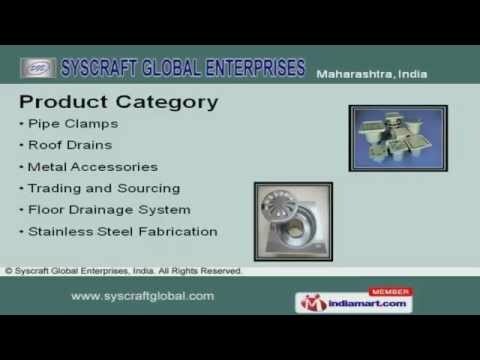 Welcome to Syscraft Global Enterprises, Trader and Exporter of Metal Based High Precision Engineering Solutions. The company was incepted in the year 1998. Our international standards and experienced technocrats make us the first choice of our clients. Timely delivery, customized solutions and safe packaging are the plus points of our organization. We offer a wide array of Pipe Clamps Roof Drains and Metal Accessories. Our Floor Drainage Systems are best in the industry amongst others. Pipe Clamps offered by us are available at industry leading prices. Our Metal Accessories are in huge demand across the global markets. We also provide Roof Drains that are nothing but the best solution for all your needs. Along with that we offer Trading and Sourcing that are a class apart.